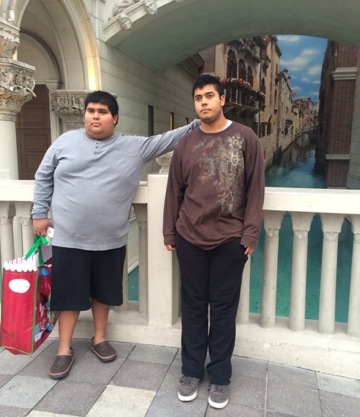 Three years ago when EGP first interviewed Josefina Nieves, she was overwhelmed with worry about what would become of her autistic son who was about to graduate from high school. Today, Nestor, 21, is in his third year at Cal State University, Northridge and wants to become an occupational therapist, she says proudly. Getting him to this point took a lot of work, said Nieves, who now helps other Latino parents find tools and resources to help their children with autism. As a parent coordinator with the Lincoln Heights based nonprofit Fiesta Educativa—a group that educates parents about autism, their rights and resources—Nieves conducts educational workshops for other parents who may be in a similar situation. She is especially interested in speaking to Latino parents who often have more difficulty because information available in Spanish is more limited. “It is very important for Latinos to know about autism,” she told EGP Monday at the El Sereno Public Library where she was scheduled to lead a workshop for Spanish speaking parents. The session was sponsored by the Los Angeles Public Library, which collaborated with nonprofit groups like Fiesta Educativa to provide autism education in April to coincide with Autism Awareness Month. Autism is a neurological disorder that causes problems in social communication, lack of language and interest in common things and behavioral challenges such as not being able to control emotional outbreaks. The autism spectrum goes from low to severe and is four times more common among boys than girls. In the U.S., one on fifty children have been diagnosed with autism, according to the U.S. Center for Disease Control and Prevention. Today, about one million people, from all ethnic and social economic backgrounds, are living with autism. According to Nieves, not speaking English and cultural differences often make it harder for Latino parents to understand the disorder. For example, they may think an autistic child’s tantrum can be cured with a “spanking,” she explained. Many Spanish-speakers do not know where to turn for help, she said. Those barriers can keep them from getting help even when it is available. That point hit home Monday, when Veronica Jacobo was the only person to show up for the library’s free workshop. According to Jocobo, her “mother’s instinct” told her something was wrong with her now 10-year old son. “Around age three I noticed he was afraid of touching the sand in the park,” she said. “And one day at the beach, he didn’t even want to get out of the car” because he “was afraid of the sound of the waves,” she explained, during what turned out to be a one-on-one counseling session with Nieves. Jacobo said she started looking for help at her son’s school and outside organizations as soon as he was diagnosed with autism. It’s been difficult, but little by little, she found help. Her son, now in the fifth grade, has an aid who’s with him one-on-one at all times in school. But there are still many challenges, said the mother of two, explaining why she wanted to attend the library’s workshop. Presentations at Stevenson’s Public Library in East Los Angeles and in Panorama City drew more parents, but one is better than none, Nieves said Monday, focusing her attention on Jacobo. Struggling at times to hold back tears, Jacobo explained the problems she’s faced trying to help her son, who sat nearby playing with an IPad. She’s attended other parenting workshops, she said, but felt all the materials they gave her to read wasn’t really helping. So “I quit after a while,” she said. Nieves took Jacobo through the Spanish language Power Point presentation she brought with her to the workshop, explaining along the way the importance of knowing more than those assigned to help parents at places like schools and local regional centers. “Sometimes you have to explain many times what you need and why,” Nieves told Jacobo in English, the language she felt more comfortable with. She explained that knowing what your child is entitled to will help you get the services from the school district or one of California’s 21 Regional Centers, private, non-profit organizations under contract to the California Developmental Services (DDS) that coordinate services to people with developmental disabilities such as autism. The Eastern Los Angeles Regional Center (ELARC) provides services to families in the greater East Los Angeles area. The regional centers can help in many areas, including with basic like skills most people take for granted, she said. “…They teach them to drive, to use money and do their chores” among other things, Nieves told Jacobo. “If the patient needs it, it is a program for life,” she added. Funding for many of the free programs has been cut back so parents have to fight for them on behalf of their special needs child, Nieves said. Getting educated is vital, she emphasized. Nieves recommends parents join organizations such as Fiesta Educativa, which offers a variety of programs. For example, at the group’s Community Parent Resource Center (CPRC) parents can get information about their child’s diagnosis and the school systems’ IEP, (Individual Education Program), as well as moral support. They hold a Fiesta Familiar (Family Party” five times a month at the home of a volunteer family, where members can share food and a good time with other parents like them. Regional Centers also offer a 16-hour Autism Parent Education Program (APEP) where parents can learn more about autism and what services are appropriate for their child. It has to be requested through a service coordinator. There is no cure for autism and there is no medicine to prevent or stop it. Most experts agree that early detection and intervention can make a big difference in how the child does in school and throughout life. The right diagnosis with the right resources are critical, emphasizes Nieves, who knows first hand that autism varies in severity from child to child, because her second child, Daniel, 19, also has autism. “His case is more severe,” she said. Daniel will not be able to do many things on his own. For that reason, she continues searching for information and resources to help both sons as much as she can. “I see my oldest son having a normal life, getting married and having kids,” but that’s not going to be the case for his younger brother, she said. Jacobo says some things are getting better now that her son is older. She says she argues less with him, but daily routines such as taking a shower or putting away his stuff are a constant struggle: Sometimes I just have to ignore him. Hace tres años, cuando EGP entrevistó por primera vez a Josefina Nieves, ella estaba abrumada por la preocupación acerca del futuro de su hijo autista quien estaba a punto de graduarse de la preparatoria. Hoy cuenta con orgullo que Néstor, de 21 años, está en su tercer año en la Universidad Estatal de California, Northridge y quiere convertirse en un terapeuta ocupacional. 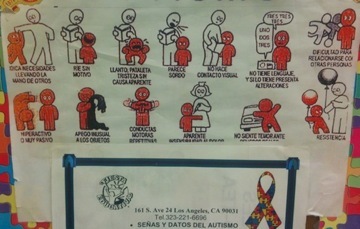 Llegar a este punto le tomó mucho trabajo a Nieves, quien ahora asesora a otros padres latinos a encontrar herramientas y recursos para ayudar a sus hijos con autismo. Como coordinadora de padres con la organización no lucrativa Fiesta Educativa—un grupo con sede en Lincoln Heights que educa a los padres sobre el autismo, sus derechos y recursos—Nieves lleva a cabo talleres educativos para otros padres que puedan estar en una situación similar. Ella está especialmente interesada en hablar con los padres latinos que a menudo tienen más dificultades debido a que la información disponible en español es más limitada. 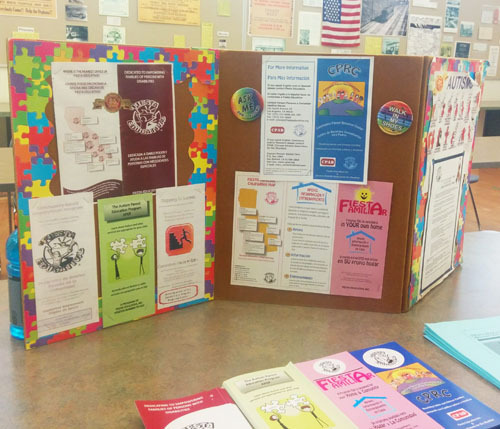 “Es muy importante que los latinos sepan sobre el autismo”, le dijo a EGP el lunes en la Biblioteca Pública de El Sereno, donde estaba programada para dirigir un taller para los padres de habla hispana. La sesión fue patrocinada por la Biblioteca Pública de Los Ángeles, que colaboró con grupos sin fines de lucro como Fiesta Educativa para proporcionar educación sobre el autismo en abril, coincidiendo con el Mes de Concientización sobre el Autismo. El autismo es un trastorno neurológico que causa problemas en la comunicación social, la falta de lenguaje y el interés en las cosas comunes y problemas de comportamiento tales como no ser capaces de controlar emociones. El espectro del autismo va de moderado a más severo y es cuatro veces más común entre niños que niñas. En EE.UU., uno de cada cincuenta niños han sido diagnosticados con autismo, según el Centro para el Control y la Prevención de Enfermedades (CDC). Hoy en día, alrededor de un millón de personas, de todos los orígenes económicos étnicos y sociales, están viviendo con autismo. Nieves dijo que el no hablar inglés y las diferencias culturales usualmente hacen más difíciles que los padres latinos comprendan el trastorno. Por ejemplo, se suele pensar que la rabieta de un niño autista puede ser curada con una “nalgada”, explicó. Muchas personas que no hablan inglés no saben a dónde acudir para asesorarse, agregó. Esas barreras pueden impedir que consigan ayuda, incluso cuando está disponible. Ese punto fue enfatizado, cuando solo una persona llegó al taller gratuito de la biblioteca. Verónica Jacobo contó que su “instinto de madre” le dijo que algo estaba mal con su hijo que ahora tiene 10 años de edad. “Como a los tres años me di cuenta que él tenía miedo tocar la arena en el parque”, dijo. “Y un día en la playa, él ni siquiera quiso salir del carro” porque “tenía miedo del sonido de las olas”, explicó, durante lo que resultó ser una sesión de asesoría uno-a-uno con Nieves. Jacobo dijo que ella comenzó a buscar ayuda en la escuela de su hijo y en organizaciones tan pronto como él fue diagnosticado con autismo. Le ha sido difícil pero poco a poco ha encontrado ayuda. Su hijo, ahora en el quinto grado, tiene una persona que está con él y le ayuda en todo momento en la escuela—comúnmente conocidos en inglés como “one-on-one”. Pero todavía hay muchos desafíos, dijo la madre de dos hijos, explicando que por eso quiso asistir al taller de la biblioteca. Presentaciones en las Bibliotecas Públicas de Stevenson en el Este de Los Ángeles y en Panorama City atrajeron a más padres, pero uno es mejor que ninguno, dijo Nieves el lunes, centrando su atención en Jacobo. En ocasiones luchando por contener las lágrimas, Jacobo explicó los problemas que ha enfrentado al tratar de ayudar a su hijo, quien estaba sentado en la esquina del salón jugando con un IPad. En el pasado, ella había asistido a otros talleres para padres, dijo, pero sentía que los materiales que le daban a leer no ayudaban realmente. Así que “lo dejé después de un tiempo”, dijo. Nieves le explicó a Jacobo través de la presentación del ‘Power Point’ en español, la importancia de saber más de los que están asignados a ayudar a los padres en lugares como escuelas y centros regionales locales. “Hay veces que tienes que explicar muchas veces lo que necesitas y por qué”, dijo Nieves a Jacobo. Explicó que el sabe lo que su hijo padece le ayudará a obtener los servicios del distrito escolar o uno de los 21 Centros Regionales de California, organizaciones privadas, sin fines de lucro bajo contrato con los Servicios de Desarrollo de California (DDS) que coordinan los servicios a las personas con discapacidades del desarrollo como el autismo. El Centro Regional del Este de Los Ángeles (ELARC) proporciona servicios a las familias en el área metropolitana de Los Ángeles. Los centros regionales pueden ayudar en muchas áreas, incluso en lo básico como habilidades que la mayoría de la gente da por sentado, dijo. “… Les enseñan a conducir, a utilizar el dinero y a hacer sus tareas”, entre otras cosas, Nieves dijo a Jacobo. “Si el paciente lo necesita, es un programa de por vida”, añadió. La financiación de muchos de los programas gratis se ha reducido y los padres tienen que luchar por ellos en nombre de sus hijos con necesidades especiales, dijo Nieves. Estar educado en el tema, es vital, enfatizó. Nieves recomienda a los padres que se integren a organizaciones como Fiesta Educativa, que ofrece una variedad de programas. Por ejemplo, en el Centro de Recursos para Padres de la Comunidad (CPRC) los padres pueden obtener información sobre el diagnóstico de su hijo y sobre el sistema escolar, (Programa de Educación Individual), así como apoyo moral. También llevan a cabo una Fiesta Familiar “cinco veces al mes en la casa de una familia de voluntarios,” donde los miembros pueden compartir comida y un buen rato con otros padres como ellos. Los Centros Regionales también ofrecen un programa de 16 horas de Autismo de Educación para Padres (APEP), donde pueden aprender más sobre el autismo y qué servicios son apropiados para sus hijos. Este tiene que ser solicitado a través de un coordinador de servicios. No hay cura para el autismo y no hay medicamentos para prevenir o detenerlo. La mayoría de los expertos coinciden en que la detección e intervención tempranas pueden hacer una gran diferencia en la forma en que el niño se desenvuelve en la escuela y en la vida. El diagnóstico correcto con los recursos adecuados son fundamentales, subraya Nieves, quien sabe de primera mano que el autismo varía en severidad de un niño a otro, puesto que su segundo hijo, Daniel, 19, también tiene autismo. “Su caso es más grave”, dijo ella. Daniel no será capaz de hacer muchas cosas por su si mismo. Por esa razón, Nieves continúa la búsqueda de información y recursos para ayudar a sus dos hijos lo más que pueda. “Veo a mi hijo mayor [Nestor] teniendo una vida normal, casándose y teniendo hijos”, pero eso no va a ser el caso de su hermano menor [Daniel], agregó. Jacobo dice que algunas cosas han mejorado ahora que su hijo es mayor. Ella dice que pelea menos con él, pero las rutinas diarias como bañarse o guardar sus cosas son una lucha constante: A veces sólo lo ignora. “Trato de no insistir demasiado”, dijo. Ahora, él escucha más e “Incluso estoy pensando en inscribirlo en una escuela secundaria regular”, dijo ella, con la esperanza de algún poder darle una “vida normal”.